This is one of my favorite breakfasts. I do not make it very often because it takes a little time, yet it is so worth the investment. I usually make this on a weekend. You could double the recipe and have some for another day during the week.. All you would have to do is add a little milk to thin it out a smidge and warm it in the microwave. I like this combination of fruit and nuts, however I have made it with whatever I had on had. This recipe serves four generous portions. 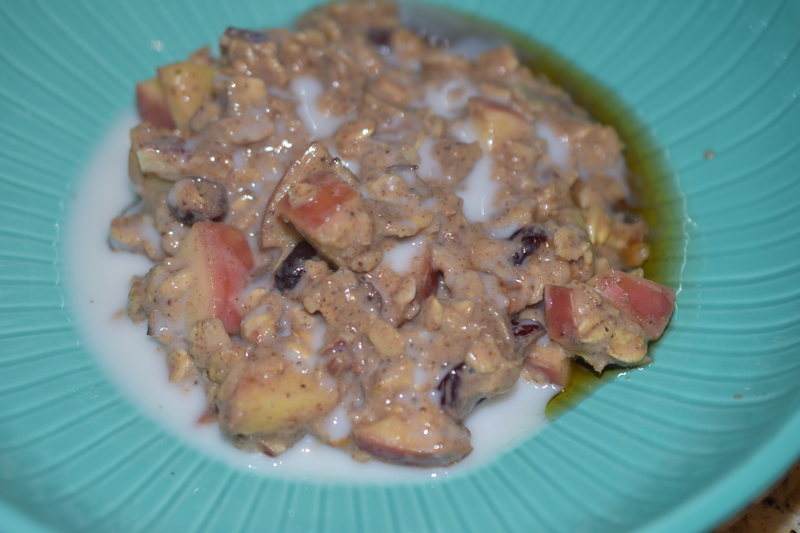 It is very filling and lends to give you plenty of energy to start your morning off right. Note: I know it looks like a lot of ingredients, but I promise you probably have virtually all of these in your pantry. You could also make any substitutions to suit your tastes or preferences. In a medium saucepan over medium heat add the apple, pecans, cranberries, and date. Stir until well mixed. Add flaxseed, cinnamon, nutmeg, ginger and salt. Stir to coat the fruit and nuts. Stirring frequently cook until the apple is slightly softened and the spices are fragrant. Add oats; stir. Cook the oats dry for about 2 minutes. This help work the spices into the oats. Add milk, coconut sugar and vanilla. Stir frequently. Reduce heat to medium-low and keep stirring. The oatmeal will slowly start to thicken. Usually when it starts to bubble it is almost done. Cook to desired thickness. Garnish with a splash milk of choice and some real maple syrup. Thank you. It is a good one to fuel the morning.